. ryū 龍 / 竜　dragon legends . The most detailed resource, take your time to visit Mark's page. Below are some of the subjects he covers. Both the dragon and snake are members of the NAGA group of serpentine creatures; Hindu Lore. In both Chinese and Japanese mythology, the dragon is closely associated with the watery realm, and four dragon kings are said to rule over the four seas (which in the old Chinese conception limited the habitable earth). In Japanese mythology, the Dragon King's Palace (Ryugu) is said to be located at the bottom of the sea, near the Ryuku Islands (Okinawa), and it belongs to Ryujin, the Japanese name for the dragon king. The palace is also known as the "Evergreen Land." In his book Japanese Poetry, Professor B. H. Chamberlain says the Japanese word for Dragon Palace (ryugu, or ryukyu) is likewise the Japanese pronunciation of the southernmost Ryuku islands (Okinawan islands). He writes about one ode in the Man-yu-shu, which says the orange was first brought to Japan from the "Evergreen Land" lying to the south. The many-storied palace is built from red and white coral, guarded by dragons, and full of treasure, especially the Tide Jewels, which control the ebb and flow of tidal waters. 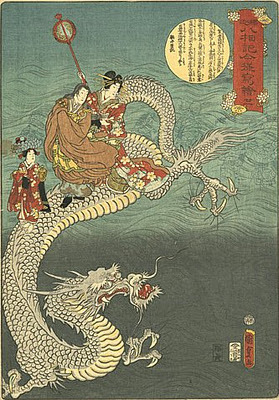 Fish and other sea life serve Ryujin as vassals, with the turtle acting as the dragon's main messenger. On the north side of the palace there is the Winter Hall, where snow falls all the time. On the eastern side lies the Hall of Spring where butterflies visit cherry blossoms while the nightingale sings. On the southern side of the palace is the Summer Hall where crickets chirp in the warm evening. Finally, on the western side is the Autumn Hall where the maple trees glow in bright colors. For a human, a day in this palace is like 100 years on earth. given at the top of this page. In Japanese mythology, the Dragon King's Palace (Ryūgū 竜宮) is said to be located at the bottom of the sea, near the Ryūkū (Ryukyu) 琉球 Islands (Okinawa), and it belongs to Ryūjin (Ryujin) 竜神, the Japanese name for the dragon king. Excerpt from "Myths & Legends of Japan"
. Mark Schumacher - The Dragon Page .
. 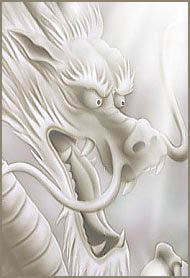 Welcome 2012 — Year of the Dragon . At the Temple Muro-Ji 室生寺の境内 along the river 室生川 the saint 慶円上人 Keien (1140 - 1223) once passed. At the riverside a female Dragon King 善女竜王 waited for him. He asked her to show her real features and after some discussion, she turned into a black cloud and showed her right hand. It had long nails of about 3 cm in five colors. Since than the riverbank is called 爪出が淵 Tsumedegafuchi. The Dragon God of Kasuga Shrine . Some horse leaders were passing along the riverbank of 上尾河 Aegogawa. One of the female attendants took off the bamboo basket from the horse and threw in into the river. She said the Dragon Deity in the river might have wanted the crystal ball in the basket.